The Tallinn Christmas market has been voted the best in Europe in a poll which included 208,000 worldwide travellers, according to European Best Destinations. “The Tallinn Christmas market delights everyone with its coziness, historical location, wonderfully preserved medieval old buildings and long traditions,” said European Best Destinations, a Brussels, Belgium-based organization for promoting culture and tourism in Europe. 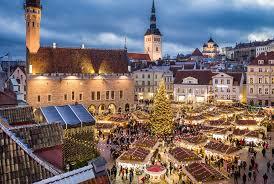 “In recent years, the Tallinn Christmas market has a number of times been elected as one of the best Christmas markets in the world,” the organization added. According to Maximilien Lejeune, the CEO of European Best Destinations, “This recognition has a very important mediatic and economic impact if it’s well used”. “Most of the past awarded destinations of our competitions (Porto, Bordeaux, Zagreb, Alpe d’Huez, Val Thorens, Strasbourg) used the official logo on all their advertising, fairs, city maps, websites, buses, flyers, goodies, to spread the word about this recognition,” Lejeune added. In the last five years, Strasbourg, France, and Zagreb, Croatia, won the title of the “European Best Christmas Market” with a significant economic impact and more than 10 million of media coverage in international media.